This SOCI 6331 Disasters and Society course is offered second time in the Disaster Studies MA Program at the University of Texas Rio Grande Valley. There are 18 students, some of them were newly admitted to the graduate study program in this semester, who enrolled in this course. The course was offered the first time in Fall 2017. This course examines the relationship between disasters and society from a sociological perspective. Key themes include preparedness, warning response, mitigation, social vulnerability, long- and short-term recovery, and international hazard management. LO 5. Problems associated with preparedness, response, and recovery in short- and long-term disasters in local and international settings. SLO 1. To hear firsthand experiences from partners in a community recently hit by a disaster (LO3). SLO 2. To hear firsthand experiences from key stakeholders, including issues, problems and challenges local, county, state, and federal organizations face in managing disasters (LO4, LO2). SLO 3. To learn how individuals who live in the Rio Grande Valley prepared for Hurricane Harvey (LO5, LO4). SLO 4. To apply theories and concepts in order to solve the problems, issues, and challenges community partners face in effectively managing hurricane disaster and emergencies (LO1, LO2, LO3, LO4, LO5). SLO 5. 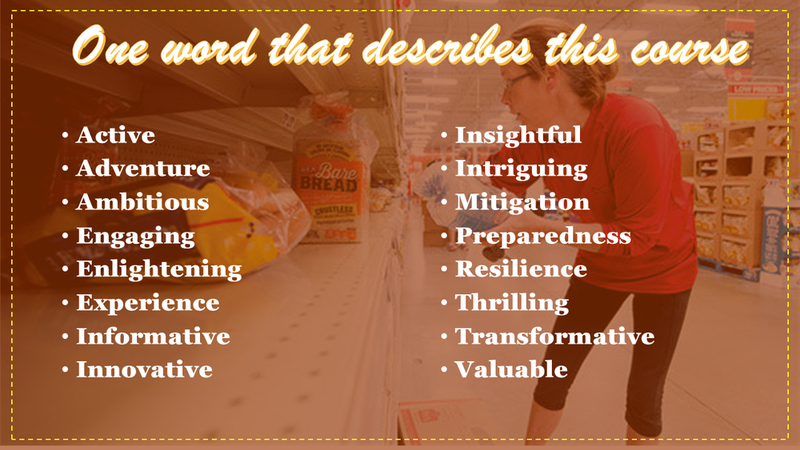 To prepare a report that presents experiential learning and sustainable solutions, applying theories and concepts learned in the classroom to problems, issues, and challenges in effective disaster/emergency management. (LO1, LO2, LO3, LO4, LO5). SOCI 6331.01, Disasters and Society, is designated as a service learning course. This graduate-level course is especially designed to provide an experiential learning opportunity to students who will become professionals in the disaster and emergency management field. To learn from community members, students will conduct an empirical study which focuses on individual disaster preparedness. Based on findings, students will understand how individual community members subjectively and objectively prepare themselves for a hurricane disaster. To provide sustainable solutions to the challenges involved in disaster preparedness, response, recovery, and mitigation, students and instructor will develop a research article which integrates the empirical study’s findings, service learning experiences, and application of theories and concepts learned in the classroom. This research will be published in a peer-reviewed journal to provide our solutions to all community partners in the RGV and beyond. The following community partners are selected. 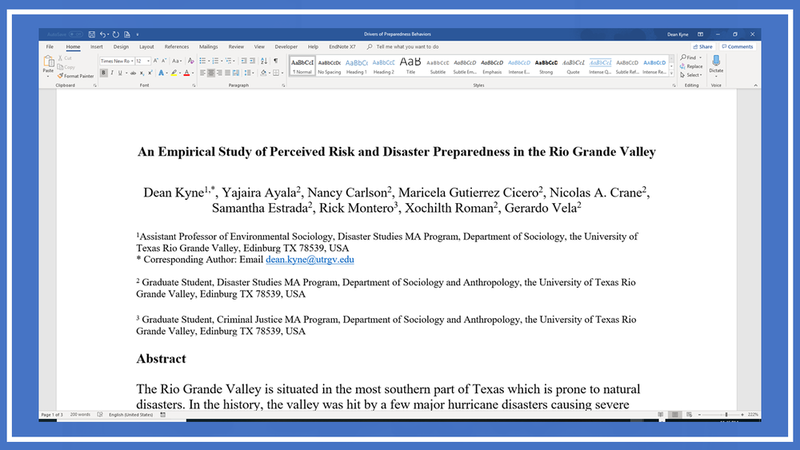 In this course, the students and instructor carry out an empirical research study in search of sustainable solutions to building hurricane disaster resiliency in the bilingual and bicultural Rio Grande Valley. A group of more than 1000 community members (CP19) residing in this valley are sampled, using a convenience sampling method. Students have an opportunity to engage in formal learning and service learning experiences to understand how community members prepare themselves for a hurricane disaster. Detailed information on this research study will be provided in the first day of the class. 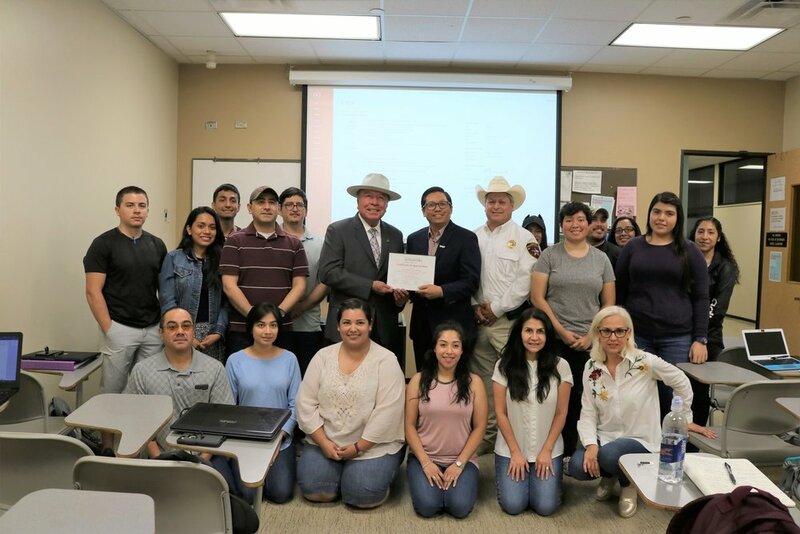 Thank you Daniel Ramirez, Communications Director /Deputy Emergency Management Coordinator, City of Pharr for delivering a special lecture in SOCI 6331 Disasters and Society Course on September 4, 2018. 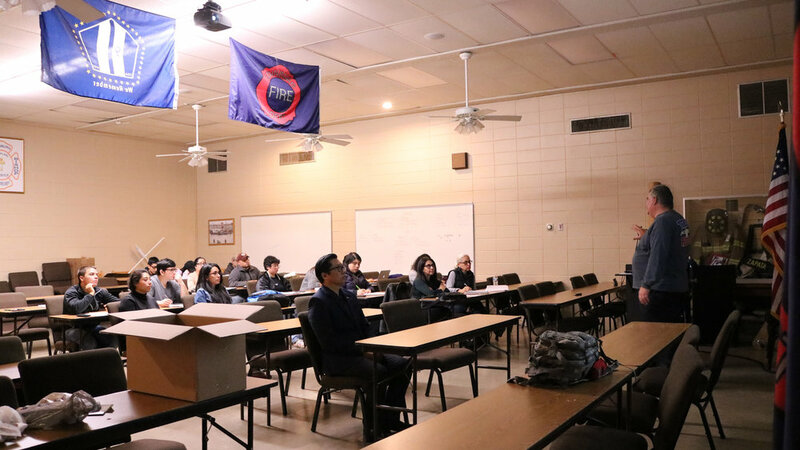 Students learned a lot from his firsthand experiences from current and previous positions in preparing and responding to disasters and emergencies. Thank you Fire Chief Jarrett Sheldon, City of Brownsville for delivering a special lecture in SOCI 6331 Disasters and Society Course on September 11, 2018. 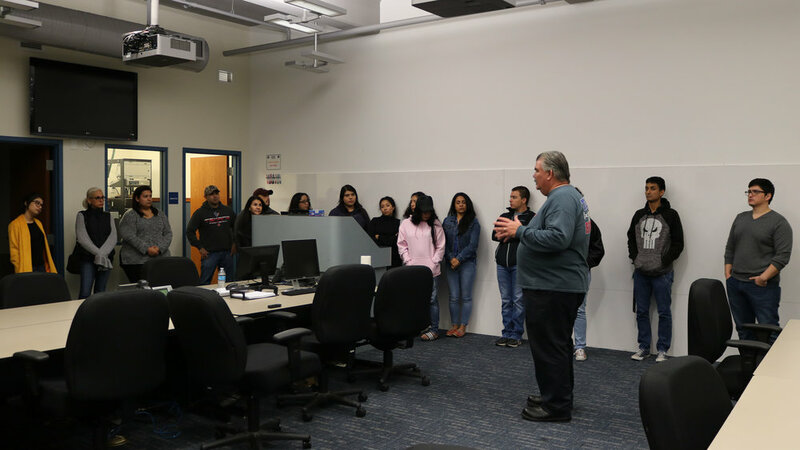 Students learned a lot from his firsthand experiences in dealing with different types of disasters. Thank you Jeffery A. Johnston, Assistant City Manager and the Deputy Emergency Management Coordinator, City of McAllen for sharing his firsthand experience of responding to Hurricane Harvey impacted areas in SOCI 6331 Disasters and Society class on September 19, 2018 . We are very proud of you and your entire response team for all you did for the victims of natural disasters. This course was designated as a service learning course which provides an opportunity to the students to engage in an academic research study. In this week, there was no lecture, but students worked on collecting the data with an online survey instrument. Each of the students (a total of 18) prepared a list of 100 sample and sent out survey. 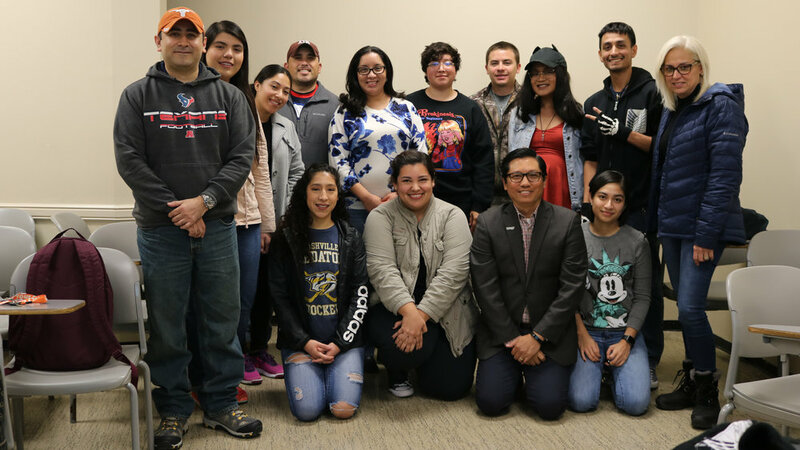 The students are working on two research studies focusing on social capital and disaster preparedness in the Rio Grande Valley. 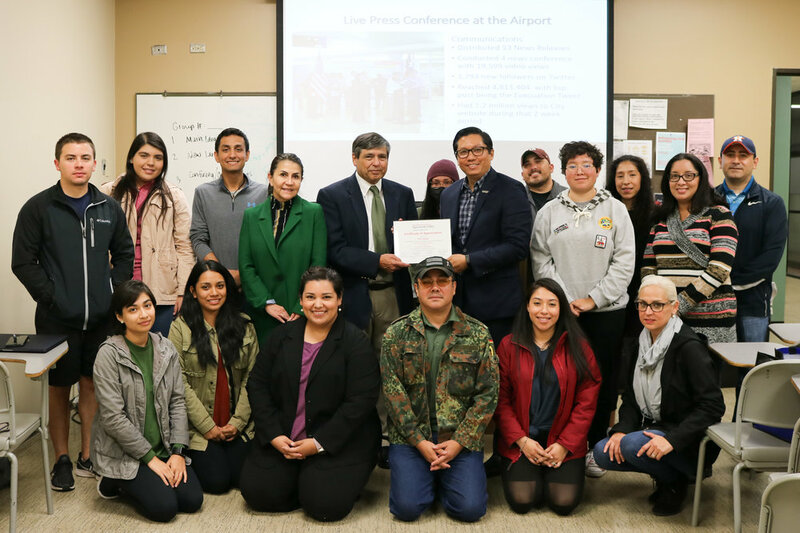 We are grateful to State Senator Juan Chuy Hinojosa and State Emergency Coordinator Tony Pena for sharing firsthand experiences in disaster management in Texas in our Disaster & Society Class in Disaster Studies MA Program. Our hearty appreciation to Billy Delgado, Emergency Management Coordinator, the City of Corpus Christi who shared his experience in preparing and responding to the Hurricane Harvey in Disaster and Society course which is offered in the Disaster Studies MA program on October 17, 2018. Thank you Fire Chief Shawn Michael Snider, Emergency Coordinator, the City of Edinburg for sharing his twenty eight years of experience in preparing and responding to all-hazards. Thank you Fire Chief Doug Fowler, Emergency Coordinator, the City of South Padre Island for sharing his experience in preparing and responding to disaster and emergency in San Antonio and South Padre Island today. Thank you Mr. Antonio Lopez, Emergency Management Coordinator, the City of Weslaco who delivered a special lecture in my Disasters and Society class on November 6, 2018. It was a great honor and privilege to listen to Dr. Ken Wisian's presentation in Disaster and Society class which is offered in the Disaster Studies MA Program on November 13, 2018. Thank you Dr. Wisian. I am so grateful to all my students for providing this opportunity to teach. I wish you a wonderful Thanksgiving! Thank you Fire Chief / Emergency Management Coordinator Mr. Tommy Ureste, the City of Mercedes who delivered a special lecture in our Disasters and Society class on November 27, 2018. 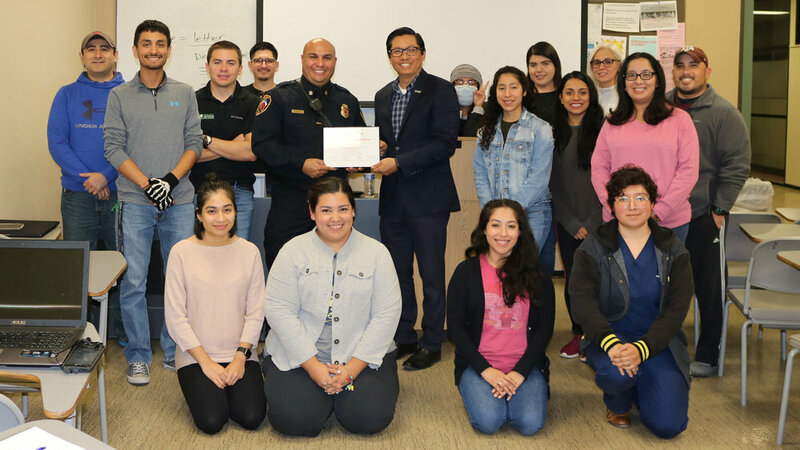 Thank you James Cardoza, Emergency Management Coordinator, the City of Mission who delivered a special lecture in our Disasters and Society class on December 4, 2018. Today was the last day of our class. My students surprised me with a lovely gift. Thank you very much. And thank you for hanging out with me in this course. It was a great pleasure to have you all in my class. Please do accept my hearty appreciation. I look forward to seeing you again next semester. Happy Holidays! To enhance understanding of disaster and emergency preparedness, students in this Disaster and Society course, which is offered in the Disaster Studies MA Program are provided with an opportunity to learn from key stakeholders who are concerned with disaster and emergency management in the Rio Grande Valley. One of the key stakeholders was the Regional Center for Public Safety Excellence--South Texas College which prepares fire and police professionals who always ensure safety of this valley. Our graduate students visited the Center on October 18, 2018 between 9:00 am and 11:00 am. 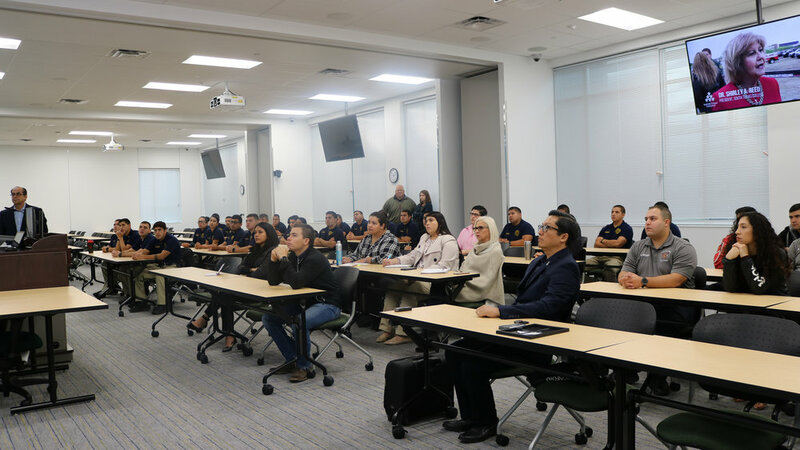 It was a great pleasure to meet Dean Mario Reyna, Business, Public Safety and Technology Division, faculty members and trainees at the Police and Fire Academies. Students gained a better understanding on how this training center, which was established on a budget of $90 million plays a critical role in disaster and emergency preparedness in this valley, the State of Texas, and the nation. Listening to a presentation by Mayor Joe McComb and his team on hurricane Harvey evacuation decision making and efforts to plan, practice, and protect the lives of citizens of Corpus Christi on November 30, 2018. Our hearty appreciation goes to Mayor, City Manager Samuel "Keith" Selman, Fire Chief Robert Rocha, Police Chief and Emergency Management Coordinator Mr. Billy Delgado. We are grateful to Mr. Billy Delgado, Emergency Management Coordinator who conducted a presentation with his section chiefs on November 30, 2018. We visited a house of hurricane Harvey disaster victim located at S Lamont, Aransas Pass, TX (picture far left) to help her unload trailer. However, the trailer was not there when we arrived. Breakfast at Whataburger in Kingsville, TX! Brain storming what to eat for lunch! Dr. Dean kyne is very good instructor and teach for each instructional activity of my master. Dr. Kyne truly cares for his students and gives them every opportunity to learn and grow. Enjoyed the class and the Guest speakers Dr. Kyne is able to get. Hands on approach to the course. Great course this semester. Thank you for the opportunity to network and meet so many professionals in the discipline. Thank you Dr Kyne for always having your office open to us should we have any questions! The instructor for this course was very attentive and was helpful as well. It was easy to get in contact with him electronically. The course did have a great amount of work for such little time. But over all great course. Very good professor. A lot of guest speakers, great way to get know people, make contacts, and learn about opportunities in field. Your class is awesome. I have learned a great amount of information from your course and value the knowledge I have obtained. The only thing that would be more helpful in the future would be to concise the folders/information on blackboard so that it is more straightforward and easy to follow.